All crewmen listed above, except for 1Lt Frederick C. Hower (CP) and Sgt Keith E. Day (R), flew on these two missions. 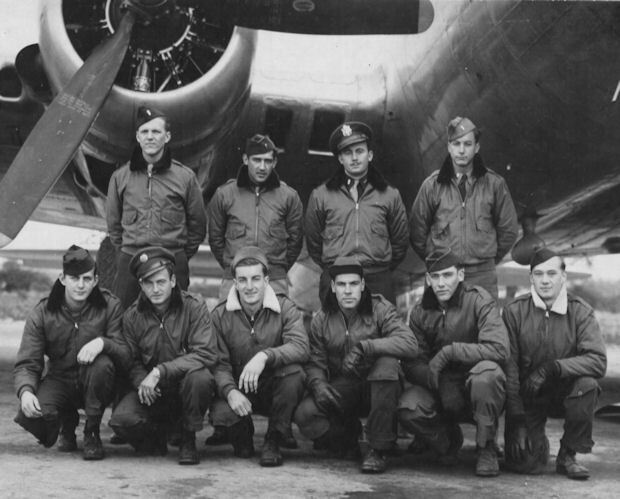 Both missions in #42-31739 Pugnacious Peter (358BS) VK-P.
Hower (CP) - Was not on the 11 Oct 44 mission. Upgraded from CoPilot to Pilot on 18 Jan 45. Flew some missions as a Lead Crew Tail Gunner-Observer. Completed his 35 mission combat tour on 08 Mar 45. Day (R) - Not on 11 Oct 44 mission. Original crewman Postek (WG) replaced Day as Crew Radio Operator. One of the Waist Gunner positions was deleted when crew size changed from 10 to 9 men. Completed his 35 mission combat tour on 04 April 45. Mission 253 - 2Lt Harry S. Seidel on his eleventh mission. - CoPilot on the 358th BS Capt Hugh B. Johnson Crew. Flew on seven additional missions. Completed 18 dispatched missions on 21 Nov 1944 (Mission 275). Had been upgraded from CoPilot to Pilot on orders dated 11 Nov 1944. Mission 255 - 2Lt Charles E. Thomas (POW) on his 30th dispatched mission. CoPilot on the 1Lt John McConnell Crew. Had been upgraded from CoPilot to Pilot on orders dated 25 Sept 1944. Flew three missions as a First Pilot (249, 250, 251).